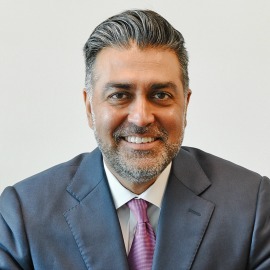 Up next in the series is a conversation with Sonu Singh, president and CEO at Reston, Virginia-based managed-services provider 1901 Group. Headlining topics over the last couple of years include merging technology with health care, cloud storage, big data, insider threat, and the internet of things, among others. What will be the main topic of interest in 2019? What markets in the GovCon space do you see growing/contracting? In 2019 and beyond, we will continue to see increased adoption of hybrid cloud as the government transitions from government-owned infrastructure to the cloud to accelerate the pace of transformation while also reducing the percentage of funding allocated to IT operations and maintenance. This trend has already started with the Pentagon’s JEDI contract and policies such as cloud smart and Data Center Optimization Initiative that are paving the way for commercial cloud to be used to accelerate the pace of transformation. We believe this trend sets the stage for the government to shift from traditionally delivered IT services to a managed services model, which represents a growth opportunity for GovCon firms that are positioned to deliver consumption-based, “as a service” IT solutions. What will 2019 hold for government contracting? More M&A activity, consolidation? IT budget cuts? How’s today’s market affecting how you develop and retain talent? With uncertainty in the budget cycle and increased competition for existing and new work, we anticipate continued consolidation in the contractor marketplace with brisk M&A activity for the next 12-18 months, particularly for niche firms that have built service capabilities associated with cloud computing and cybersecurity. From a talent management perspective, the contractor community must remain focused on hiring, training and retaining skilled practitioners to support the next generation of GovCon needs associated with cloud computing, managed services and cybersecurity. It’s our belief that with instability in the budget cycles, the government will seek to leverage cloud to reduce their IT operations and maintenance spending. Anticipating this need, 1901 Group is partnering with academia to develop modern curriculum for tomorrows needs today by hiring interns and providing a career map with relevant skills areas such as DevSecOps and cloud management platforms, application migration, cloud security and enterprise cloud managed services. What’s been your business strategy across multiple presidential administrations and what is your organization’s plan for growth in 2019 and beyond? How has your company best overcome legacy infrastructure? 1901 Group has always approached the GovCon market with an “as a service” delivery model that provides cost-effective, 24×7 managed services for our customers. Our business strategy led us to obtain FedRAMP authorization and leverage cloud solutions to the maximum extent practical, aligning with policies such as cloud first, cloud smart and the Data Center Optimization Initiative. We feel these strategies transcend presidential administrations and remain a focus of each new administration to transform federal IT through commercial best practices and innovative IT solutions. 1901 Group is well prepared for this transformation, as we have built substantial cloud migration and operations capacity — all of which delivers real value to our customers. As GovCon service delivery models continue to incorporate more cloud services, retention of skilled human capital will be a major concern for the entire IT community. The demand for cloud IT talent exceeds supply, which creates short-term opportunity for employers to attract talent from competing public, private and/or academic organizations; however, this imbalance also creates long-term instability for employees, employers and the impacted government program or service. At 1901 Group, we are excited about our commitment to recruit, train and grow IT talent at our Enterprise IT Operations Center in Blacksburg, Virginia, which offers our employees quality of life benefits that we have seen help us retain the talent our business and our customers need. What future collaboration topics and projects should take place between the public, private and academic sectors? Have you seen improvement or disconnect the last five years? One of our core 1901 Group beliefs is that our IT community (public, private and academic interests) has a responsibility to develop IT talent now and for generations to come. The IT talent our agencies, companies, organizations and universities need simply doesn’t exist today at the level and volume to satisfy demand; therefore, growing IT talent is a perfect example of where our IT community can collectively develop curriculum, encourage education, foster training and reward expertise. We absolutely have seen improvement in the collaboration and cooperation across public, private and academia to grow IT talent, including recent initiatives such as AWS Educate, and recent announcements such as the Virginia Tech Innovation Campus coming to Northern Virginia. Adoption of cloud services may be a highly effective catalyst for acquisition policy and acquisition reform. As we consider several federal acquisition reform initiatives including the Federal Acquisition Streamlining Act, the Clinger-Cohen Act and the Federal IT Acquisition Reform Act, the common limiting factor of these efforts’ effectiveness is/was the fact that there are powerful nuances and complexities associated with operating within and across executive and legislative branches. This requires change to numerous facets of government at the interagency and intra-agency levels to actually achieve change. The potential that the cloud brings to pragmatic federal acquisition reform rests in the fact that cloud inherently requires: 1) government buyers to change what is purchased, 2) government managers to change what they monitor and measure and 3) government IT support personnel to change what they are responsible for doing on a daily basis. Cloud materially impacts roles and responsibilities, and we anticipate the federal government will focus on training the federal workforce to monitor and manage more… while owning and operating less.